Sailing with the Galiano and Valdés expedition that reached Nootka Sound in 1792 in the schooners Sutil and Mexicana, José de Espinosa y Tello de Portugal (1763-1815) participated in the last major Spanish voyage to the Pacific Northwest in the 18th century. An astronomer after whom Espinosa Inlet and Little Espinosa are named, he has often been incorrectly identified as the uncredited author of a journal that appeared in 1802 with nine folding maps and eight engraved plates. This work contains an exceptional historical summary of the preceding Spanish visits contributed by, but not credited to, M.F. de Navarette. Espinosa was picked up by the Malaspina expedition from Acapulco, along with Ciriaco Cevallos, an astronomer, because, among his various skills, Espinosa had been trained to operate two small Arnold chronometers from London that he brought on board to calculate longitude. At Nootka Sound, Espinoza and Cevallos were sent by Malaspina to explore the inner channels of Muchalat Arm and Tlupana Arm, ultimately reaching Maquinna's winter village at the head of Tahsis Inlet. The Spaniards noted Maquinna had an armoury of 14 muskets and American John Kendrick had installed four windows in Maquinna's longhouse. 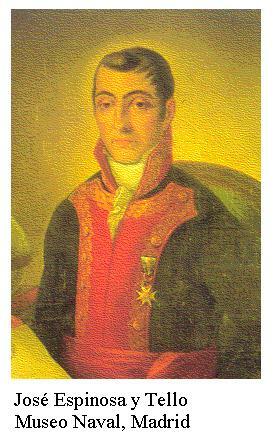 José de Espinosa y Tello de Portugal began his navel career in 1778, later working as a cartographer in Cádiz. Due to health problems, he wasn't able to join the Malaspina expedition when it embarked but he did so later in Acapulco. Upon his return to Spain he became aide-de-camp of Admiral José de Mazarredo, then was appointed director of the Hydrographic Office in Madrid in 1797. Refusing to recognize the authority of King Giuseppe Bonaparte in 1808, he moved to Seville where the patriotic movement sent him to England to continue his cartographic work for Spain. He returned to Spain in 1815 to resume his post, but died soon thereafter. His unpublished Nootka account is in Madrid's Museo Naval.